While trying to set up Boot Camp, I received an error shortly after the process finished. Checking Disk Utility on both the software and Terminal, I was left with the space I set for my Boot Camp partition as unusable. I tried to delete/unmount/format/erase that partition but after multiple failed attempts I ended up just losing access to that space entirely. This happened twice, going from 500GB of usuable space to 250GB to 112GB. 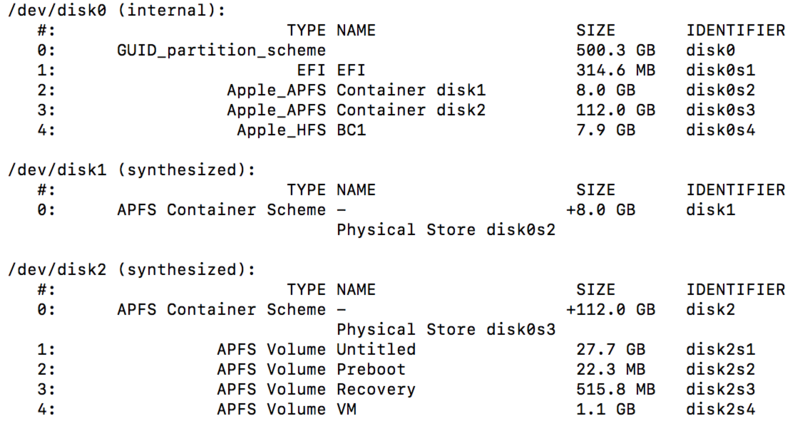 Below are screenshots from Terminal and the Disk Utility. Below is the output from the command gpt -r show /dev/disk0. If you want find the free space, there is a third party utility that will show you were it went. This utility does not require installation or your password to use. You can find more information on this utility from the driveinfo website. Assume your downloads go to the default download folder. You and find the free space by downloading and entering the command given below. An alternative to driveinfo command would be the macOS command given below. To use the gpt command, you would need to disable System Integrity Protection (SIP). If you can post the output from either of these commands, then help could be provided on how to recover the missing space. Not the answer you're looking for? Browse other questions tagged hard-drive high-sierra bootcamp disk-utility partition .